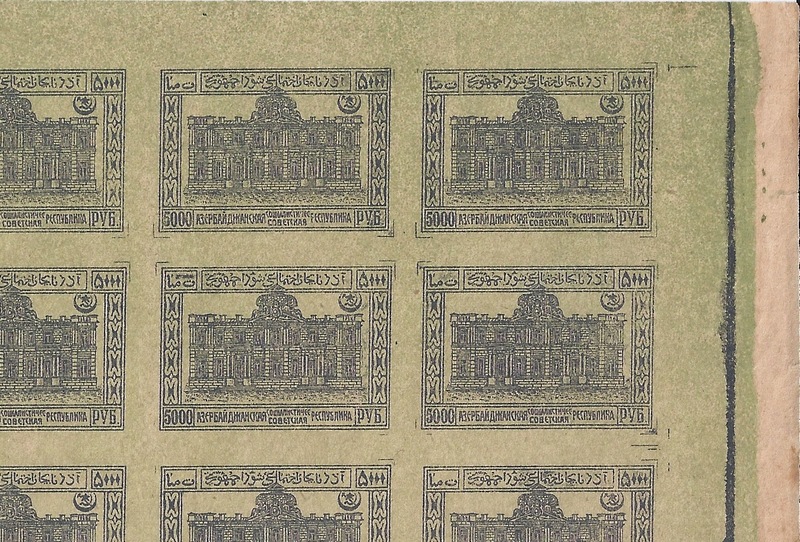 Azerbaijan's 1921 Soviet pictorials were printed on large sheets of newsprint and normally cut up along gutters into smaller half sheets before distribution; remainder uncut sheets were sold off in the 1930s but usually cut up either by dealers or collectors - they are just too big! The printing was actually carried out to quite a high standard and the one major error - inverted clichés in the 3000 rouble sheets - appears not to have been philatelically motivated. Now the 5000 rouble top value was widely used just like all top values in periods of high inflation. Mint multiples like my block of 36 are scarce, maybe even very scarce. There were few remainders of this stamp. 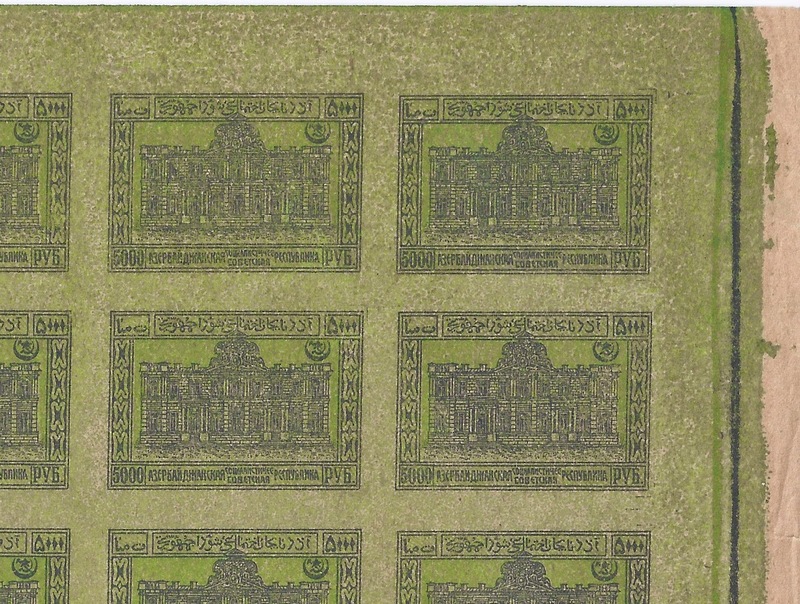 In contrast, the stamp with the extra colour wash is common in mint multiples - it was sold off with the remainders of the issued stamps. But why wasn't it issued? If stocks of the 5000 r were running short, why weren't the large quantities of this "trial" pressed into use? I think I have an answer. Look at the issued stamp. At the corners of the stamps you can see printer's guidelines which have not been cleaned off the lithographic plate. In my block of 36 it is only in the top two rows that these guidelines can be seen - in the rest of the block they have been cleaned off or weren't used. Now look at the unissued stamp.There are some traces of guidelines under the darker wash but basically they have gone. They have been partially removed, cleaned off. 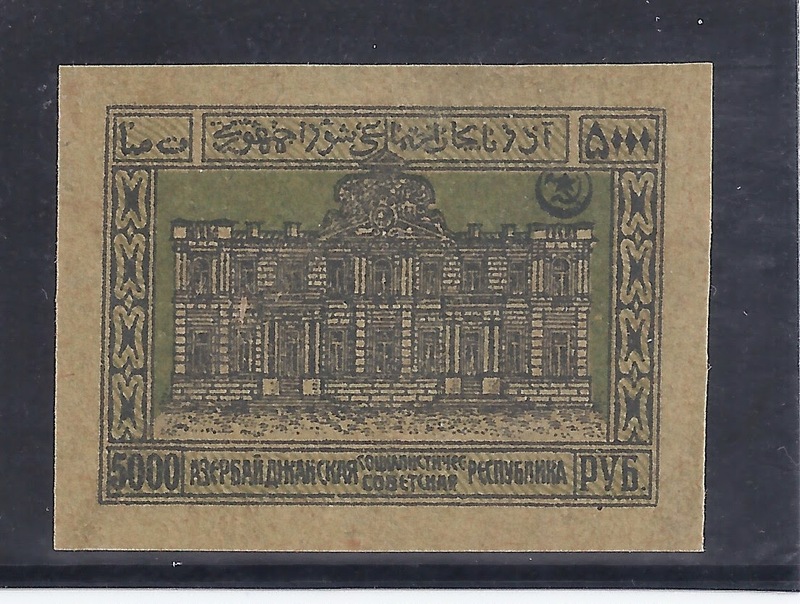 For example, look at the top right corner stamp and look underneatth the "5000" and the "pyb" on both blocks. This is strange - if the Trial was printed first, it would surely have the guidelines at least as clear as on the later printing. I conclude: the so-called "Trial" was a second, later printing of the 5000 rouble made when stocks of that top value stamp were running out. The appearance was improved by adding the second colour wash. But then for some reason, the new printing was not put into use. Maybe it was made obsolete by the issues of the Transcaucasian Federation of 1923 or maybe the printers ran out of green ink before a useable quantity could be printed. Certainly, it was not issued and was sold off as remainder stock in the 1930s. Michel mentions the unissued variety; Gibbons does not.